Things are moving fast this fall. 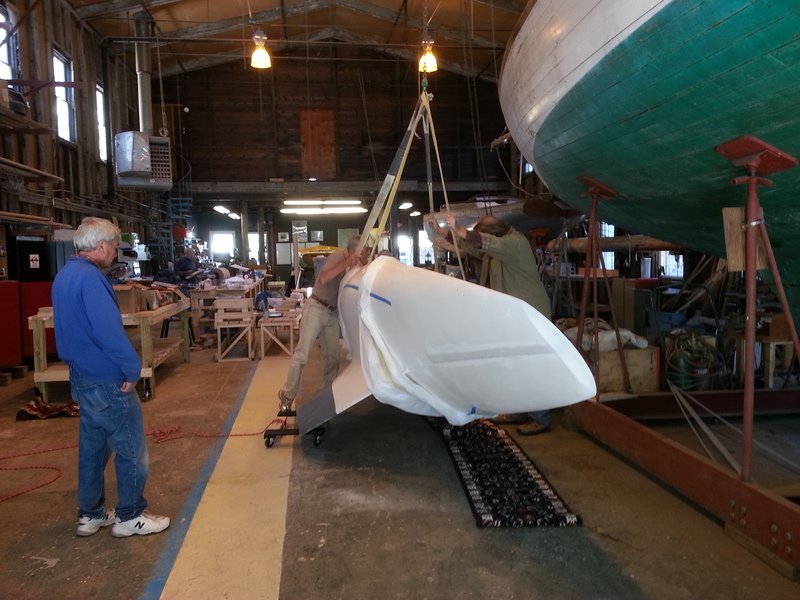 We’re working on completing all the deck fittings and soon will be moving on to boom fittings. 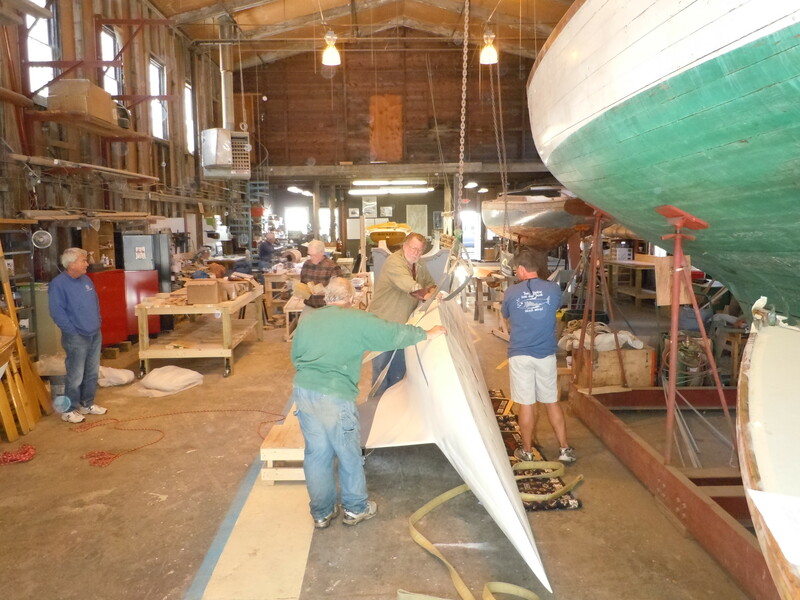 Our woodworker who is building our deck hatches, monitor, and companionway is back from summer hiatus. It seems as everyone is really charged up! In September we received display cradle designs from Roger Martin Design, a naval architect firm. This design is similar to one proposed by the School of Engineering students in their project with us last year. 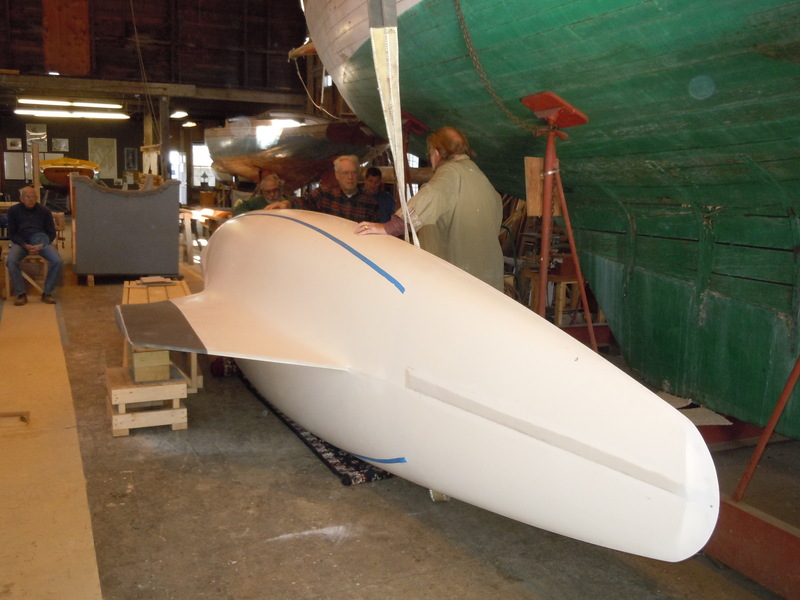 At that time we were not sure how strong our hull and deck were so we opted for “Plan B” as a student project. 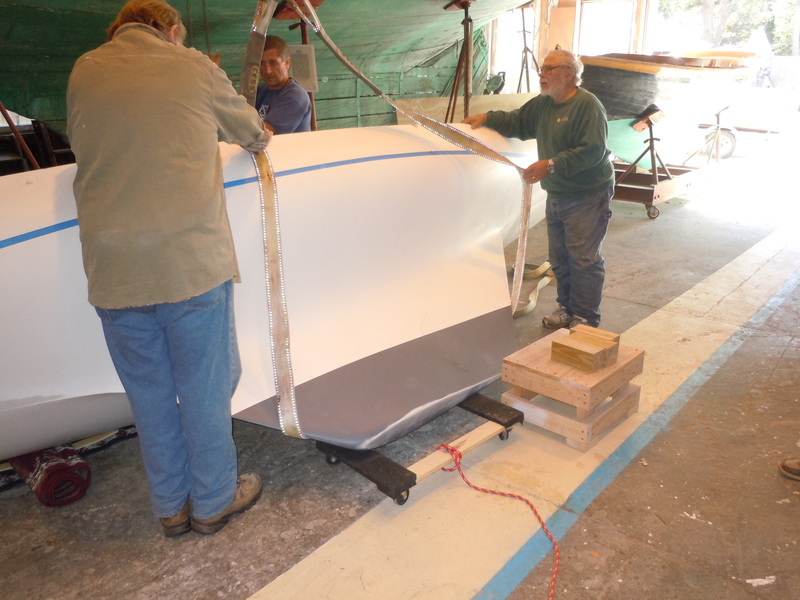 Now that we have the hull, we are levering their “Plan A.” It will be quite spectacular! Three 2″ o.d. 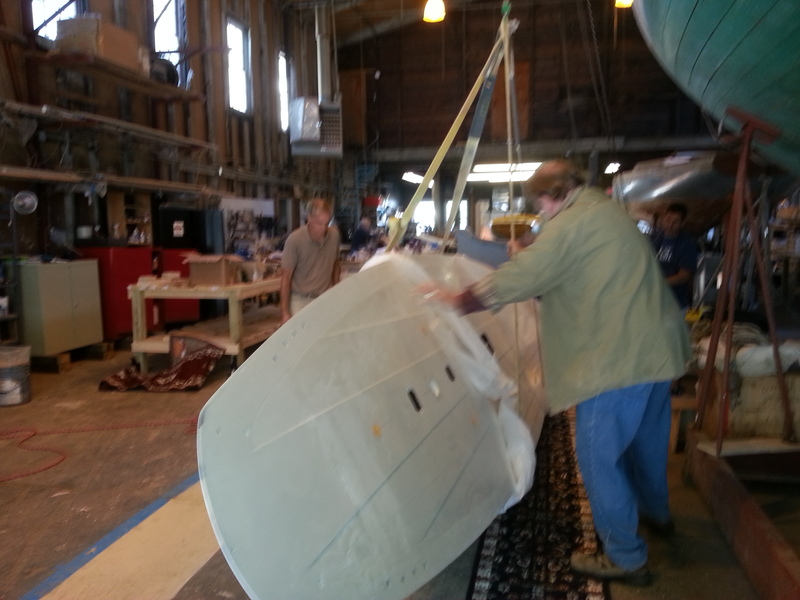 steel rods will be inserted through the keel. These rods are welded to blocks at 15 degree angles replicating her heeling over and attached to a heavy steel 6′ square base plate. Thus the RELIANCE will appear suspended in air without any stray guywires. 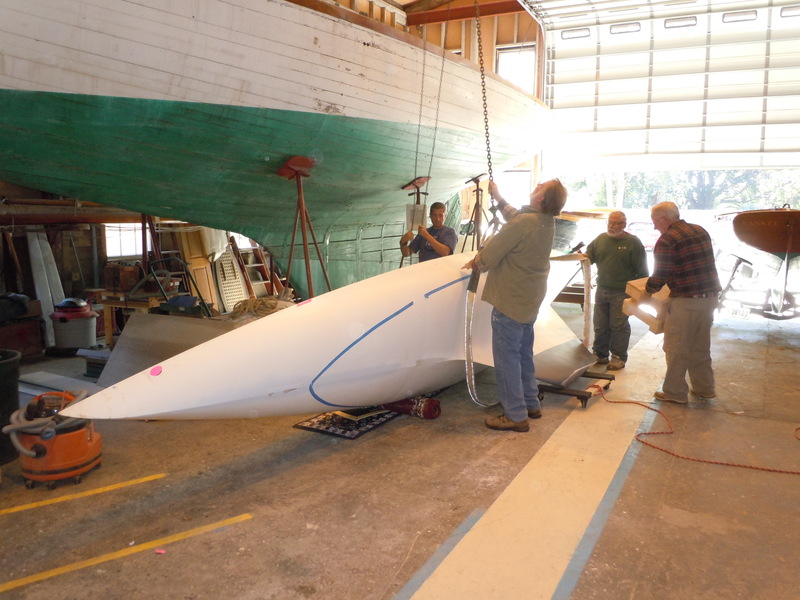 We began this week on a biggest technical challenge, drilling three perfectly center-aligned and parallel 2″diameter holes through 3′ of keel. On Tuesday, we moved RELIANCE under the chainfalls and turned her on her side so we can position the drilling mechanism. Over the next few weeks, we’ll make certain of all our alignments, build the bore jig, and complete the drilling – VERY CAREFULLY! 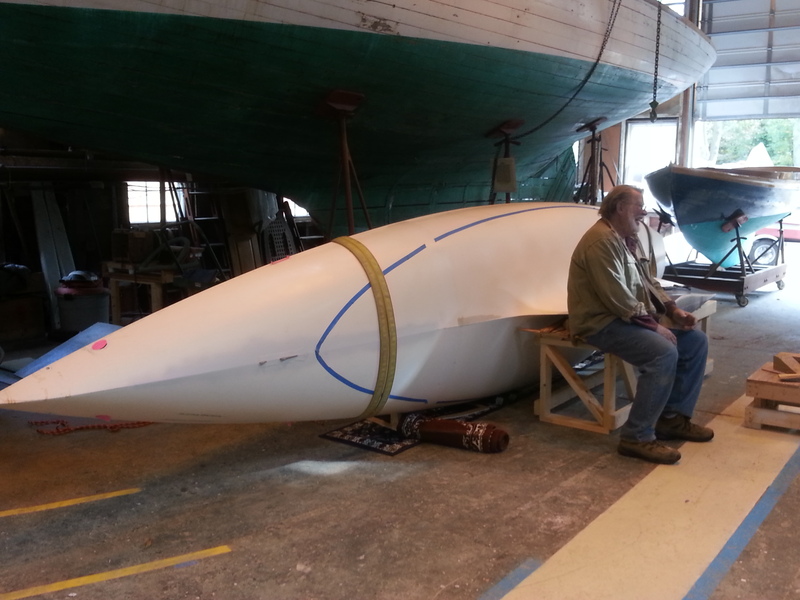 In the meantime we continue to work on our 4′ real-sized wooden spar cross sections, the rudder, spreaders, and a myriad of other tasks. Enjoy the pictures…. 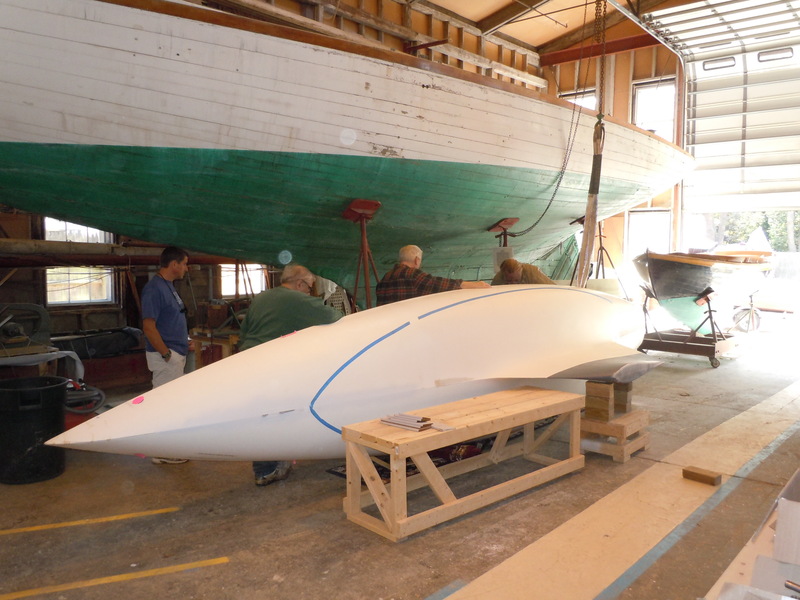 This entry was posted in Project Manager's Welcome and tagged America's Cup, boatbuilding, Herreshoff, model making, RELIANCE, roger martin design, Roger Williams engineering on October 26, 2013 by Herreshoff Marine Museum/America's Cup Hall of Fame.